Have you signed up for Google Calendar? If yes, here is five ways, tips and tricks for Google Calendar user to make better use of Google’s free calendar service. To make sure the calendar entries are kept private, click the down arrow under My Calendars, select “Share this calendar”. Then, uncheck “Make this calendar public”. Ensure only your name listed under “Share with specific people”. It is also possible to ensure privacy of individual calendar entry by clicking it and selecting “edit event details” in the pop-up window. By doing that, others are unable to view the calendar event by choosing either Default or Private in the event details dialog. Seeing one day’s or even one week’s of events at a time may not give good overview, the user can choose monthly view as default view. It can be done by clicking Settings > General at the top of the screen. From the drop-down menu next to the “Default View”, select “month”and click “save”. It is one of the nice gadgets of Google calendar which gives a four-day weather forecast on the Google Calendar. To activate the weather report onto the calendar entries, click Settings > General. Under Location, input your city/state/ZIP code. Choose either Celsius or Fahrenheit under “Show weather based on my location.” Click Save. 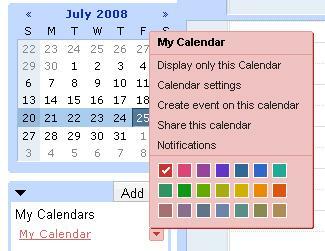 This feature allows adding and editing Google calendar without clicking on the mouse. For example, use “C” to create an event, “M” to change to monthly view, “W” to change to the weekly view, “D” to see day’s entries, and “Q” to open the Quick Add pop-up window. For complete list of shortcut, refer to Google Help Centre. It is possible to download public calendars under google calendar gallery. It is football season again. I would be able to download the “English/Scottish Premiership Fixture list season 08/09” to my personal calendar. Type your desired calendar and click the “Search Public Calendar”. A long list of Public calendars become available. Choose your desired calendar from the gallery, click the “Add to Calendar” button. There are public calendars for TV shows, sports teams, presidential candidates, and movie and DVD releases are entries listing celebrity birthdays, phases of the moon, and the holidays celebrated in various countries available in the Gallary. Current hottest event should be a calendar of events for the upcoming Beijing Olympics. With that, I am not going to miss my favorite basketball match.